Le mélange de design contemporain et traditionnel rend cette deux chambres, deux salles de bains penthouse condo un délice. Belle tuile de travertin étend à partir de la porte d'entrée pour les chambres de moquette. Un thème de la plage moderne accueille les voyageurs de plage fréquents et aide les mélanges de toutes les mises à niveau uniques et accueillis! Le salon confortable comprend un canapé en cuir avec chaise longue. La porte coulissante en verre donnant sur un grand balcon avec une vue magnifique sur la côte sud de l'océan Atlantique et la voie navigable intra-côtiers. Le concept ouvert offre le cadre idéal pour des vacances. Pour vos loisirs, les propriétaires ont épargné aucune dépense. Le salon comprend un 55 'HDTV à écran plat avec un son surround ainsi qu'un lecteur Blu-ray (Netflix activé) et la console X-box jeu vidéo (jeux inclus). Une connexion HDMI est disponible pour la plupart des appareils i-OS (iPhone / iPad). Un ordinateur portable est ici pour votre usage pendant que vous êtes ici donc, il n'y a pas besoin d'apporter votre propre. Câble avec plein HDTV disponible dans chaque chambre, ainsi que d'une connexion Wi-Fi rapide (service de 10Mbs!). La cuisine bien équipée a de nouveaux appareils en acier inoxydable. La salle à manger peut accueillir confortablement jusqu'à 4 personnes et dispose de superbes couchers de soleil magnifiquement présentés par le sol à des miroirs de plafond dans le salon. La chambre principale avec salle de bains, est joliment décoré avec un lit king-size, tables de nuit, système d'organisation de placard, mural 40 pouces HDTV avec un lecteur Blu-ray. La chambre principale est assez spacieuse. Un joli coin salon fait un excellent endroit pour lire un livre ou tout simplement profiter de la vue sur l'eau à couper le souffle. La porte coulissante en verre donnant sur le balcon pour un accès facile aux brises de l'océan et le soleil du matin étonnant. Le grand balcon, avec table et chaises, offre l'endroit idéal pour profiter d'un bon repas tout en regardant les vagues de l'océan ou de voiliers sur la voie navigable intra-côtiers. Ne pouvez-vous imaginer que vous profiter du soleil, les brises de mer douce, ou en sirotant un bon vin tout en regardant un coucher de soleil spectaculaire sur la voie navigable intra-côtiers! Ceci est un immeuble sécurisé avec parking souterrain et un parking extérieur. La piscine en front de mer a beaucoup de sièges, tables, parasols, une cabane, barbecue, et des toilettes. L'océan est à quelques pas de la piscine. It was a great experience working with Brad. The condo is so spacious and comfortable. We were surprised to find everything you need to spend the day on the beach-chairs umbrella toys boogie boards etc. Also a great location. Highly recommend this condo. Great location; responsive owner; clean, safe, nice building. Brad was great to work with - very responsive to questions. Unit is comfortable and well equipped in a safe building with nice amenities. Bed is very comfortable and you can watch the sunrise from bed. Watch the sunset from the balcony. A great place to stay. I wanted to take an opportunity to rate this really adorable beach condo, especially since I found a recent review to be so off point. 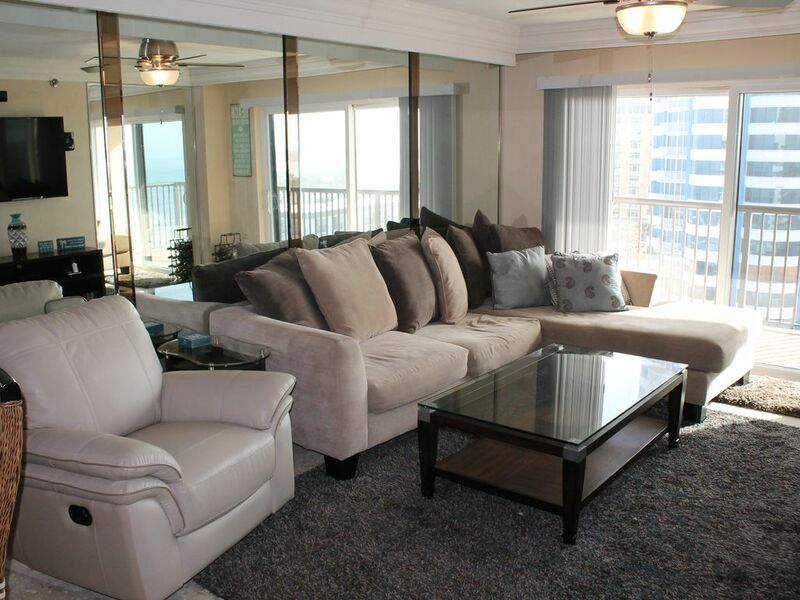 We had an absolutely great time at this Daytona Beach condo it really is the perfect unit. When you walk in the door you are greeted by an open floor plan with huge doors to the sprawling balcony. The kitchen is outfitted with stainless steel appliances in a black and white motif. The glass dining table fit us all comfortably and fit the beach aesthetic throughout the apartment. The living room contained what seemed to be a new leather recliner and a large chaise sofa. The TV had cable and Chromecast for Netflix. All three TVs in the apartment allowed you to cast Netflix from a tablet so it was super convenient at night, everyone could watch what they liked. My favorite part of the stay was enjoying the winter sun courtesy of the southern exposure and floor to ceiling doors and nearly wall to wall mirrors in the apartment. You really get an amazing view from just about every angle and vantage point. The guest bedroom was well appointed with two twin beds and a rollaway bed in the closet. We made good use of the rollaway and the game system. The master bedroom is huge with nearly wall to wall expanse of windows. I was instantly struck by the unobstructed view of the intercoastal. We left the windows open for a wonderful breeze throughout the day and the sound of the ocean at night. There is a cute little seating area with another leather recliner positioned to take full advantage of the rooms duel exposures. Possibly the best part of the room is that the design of the apartment means the master gets not only a wall of south facing windows but also a large set of ocean facing glass sliding doors leading to the deck. My favorite place to sit was outside on the large sectional wicker patio set to enjoy the really spectacular view from the deck. The southern orientation gives you both the sunrise over the ocean and sunset over the intercoastal. I worked with Brad throughout the whole booking process and through my stay. When we found out the icemaker wasn’t working, we let Brad know and he had it fixed the next day. He told us many times in his emails to let him know if things were not how they should be and he would take care of it. He is a man of his word. If you are looking for a great little top floor penthouse right on the sands of Daytona Beach Shores with stupendous views this is the place for you! Not as advertised, pictures need updated. the Sandpoint property was beautiful and I highly recommend it. When we arrived after 15 hours on the road we found no toilet paper, paper towels or garbage bags. You are asked to do a load of laundry which is normal, but there was no laundry detergent! Also the cleanliness could have been better and most of the lights in the kitchen did not work. The Pictures of the balcony and family room need updated! The booking process was easy and the owner was easy to communicate with. I apologize for the negative review but I was really put out about the balcony, no ceiling fan and did not care for the furniture out there, (different from pictures). While others enjoyed the wonderful breeze we could not. The condo could be a real gem just needs in my opinion a little TLC. I'm sorry to hear through this review that you did not have a good experience in my condo. I wish you would have contacted me. As stated in the Welcome Package, I ask that renters contact me about home maintenance issues, so I can have my handy man fix the problem. I am sure we could have resolved some of these issues during your stay. I pride myself on being responsive to any concerns that arise (and sometimes they do) as soon I am made aware. It is true that the pictures did not capture the new furniture that was purchased for the unit. They were delivered after you booked. We enjoyed our stay. The Condo was excellent in every way. Got some excellent pictures on the sun rise Really enjoyed our self. Only concern was the parking. We drove a mini van and getting in the parking spot in the garage was tasking. So we parked in the parking lot outside. Our only mishap was My sister had a fall at the pool and hurt her hip.